Interstate 405 drivers and bus riders count on the express toll lanes for a faster trip when they really need it, but during the peak of the afternoon commute even the fast lanes have their slow spots. Work this week will help address a spot where cars slow down to exit the northbound express toll lane south of State Route 527 by adding a new lane in Bothell to give drivers space to pull out of the express toll lanes before merging into the regular lanes. Every weekday, about 51,000 drivers choose to get in the express toll lanes. During the peak of the afternoon commute, there are more cars in each express toll lane than in any other lane on I-405, moving an average of 26 miles per hour faster than the regular lanes. But that big demand for the express toll lanes creates a new set of challenges, especially in the areas north of SR 522 where there is only one express toll lane in each direction. One particularly crowded spot is the northbound area between Northeast 195th Street and SR 527, where nearly 5,000 cars merge into or out of the express toll lanes daily. During the afternoon commute, when many cars in this area are trying to get over to SR 527, cars decrease their speeds in the express toll lane to find a gap in the regular lanes as they merge over. Since there’s only one express toll lane in this area, there’s nowhere for cars to pass slower-moving vehicles, which can create backups behind them. 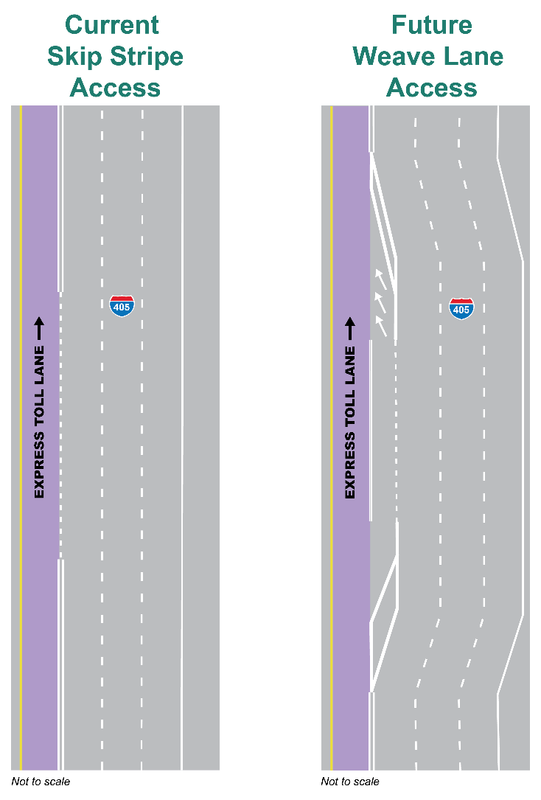 The new lane will help address this issue by giving drivers a place to pull out of the express toll lane before slowing down to merge into the regular lanes. The new lane will stretch for almost one-half of a mile between Northeast 195th Street and SR 527, about as long as eight football fields, to give drivers more space to move over to where they need to be. New lane will give drivers a place to pull out of the express toll lane before slowing down to merge into the regular lanes. This new lane is not to be confused with the new peak-use shoulder lane which opened a couple weeks ago. That improvement gives drivers a new regular lane to use between SR 527 and I-5. The new lane for merging in and out of the express toll lanes is another of more than a dozen improvements to the express toll lanes we’ve made over the past year-and-a-half based on driver feedback. Other improvements have included giving drivers more room to merge and opening the lanes to everyone for free on nights and weekends. This week, contractor crews will restripe all the lanes in this area between Northeast 195th Street and SR 527. During this work, I-405 will be reduced to one lane nightly between 9 p.m. and 5 a.m. Please note that this work requires favorable weather conditions to complete the lane striping and wet weather could postpone the work. For the most up-to-date information regarding these closures, please visit the I-405 Construction Update page. We expect that it may take drivers a little while to get used to the new access point. So be alert when you’re driving through the area, and get ready for the road to look a little different. More confusion for the already confused drivers of the PNW. Bet number of wrecks increases. Looks "good" in theory. I believe the number of wrecks will be higher due to this change. Thanks for this much needed improvement. Hopefully this will reduce the congestion on the express lane and reduce the toll price on the last leg. Your changes are appreciated. It's nice to know those in charge are really taking a look at it and moving forward. I know it takes time. I hope this helps! Thank you! Rather than a crossover merge lane, it would be safer to separate them. Exit only in one area, and a little further, perhaps after a major interchange or freeway exit, an Entry only. There is only one way to help traffic. MORE LANES!!! PERIOD. This is an obnoxious proposal that will either do little or as someone already pointed out cause accidents. Being from Los Angeles I just don't understand how this state just doesn't get it right when it comes to traffic. Please call up Caltrans in La and half their people show you how it's done. I'll tell you now that the 405 needs at a minimum to add two additional lanes in both directions to even begin to handle the demands on this freeway. Stop painting lines and start laying asphalt! Now before all of the new residential properties that are being built in mill creek, snohomish and adjacent areas get filled. You think it's bad now? You have a serious problem on your hands in 1-2 years. I don't know if this is the correct forum for this question but when will the state add another lane in both directions from Maltby to the Snohomish river bridge (522)? The backups are quite frustrating. I also believe an overpass @ Maltby would be very beneficial. Soooo much better. I drive it daily in the afternoon, and it's much easier now to get across all the lanes. Major difference. Thank you! This is an inexpensive and quick solution. Adding more lanes and rebuilding bridges causes years of construction, including more accidents and backups. This is what, a night or two for re-striping, using existing asphalt and some paint/signage? This can be done now, and as a paying toll customer, I appreciate it. I'm also looking forward to new laws restricting (and hopefully enforcing) cell phones while driving. Most accidents I see on I-405 are likely caused by distraction. And we can't compare what they do in CA vs. WA unless we choose to go the route of a 10% income tax. I used to live in CA, and I really don't miss that. But you cant have it all. Glad for the small tweak, will have to see how it works out. I generally get off at WA522 because traffic backs up so bad north of there (and the price goes up dramatically for the toll lane). But maybe these couple tweaks will help. More lanes just results in more sprawl and more traffic. Where do you stop? Double decker 8 lanes in both directions? Frnkhsr, Looking farther into the future, in coordination with many stakeholders along the I-405 corridor, we have developed a master plan for I-405 improvements (PDF) focused on groups of projects that directly address the worst congestion chokepoints as funding becomes available. The master plan calls for adding two additional lanes in both directions but is currently unfunded. kanda, we look at each individual access point and how they are being utilized. In this case, there are traffic characteristics and topographical limitations that make your suggestion challenging. 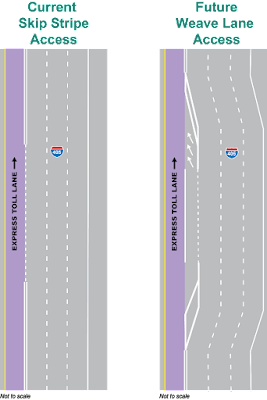 The merge lane is intended to match the speeds in the express toll lanes while keeping the traffic separate. We also need to ensure that drivers have enough advanced notice to merge over or exit as they need to. I don't think that is the problem, it is the limited ingress and egress points that is the problem. I too have lived and commuted in some of the worst traffic areas in the country, and 405 (here in WA) is by far the worst design I've driven on. What WSDOT and Sound Transit need to understand is that we (I speak collectively as all the data shows this is a super majority consensus) will NOT go out of our cars and the majority of commuter cannot (or will not) carpool. The economics of what the two organizations are trying to do (force cars off the road by making it too miserable or expensive to drive) does not support what the commuting public demands, and forcing carpool lanes and express lanes will eventually collapse under its own weight and take the puget sound economy with it. It's simple math, and the civil engineers that are coming up with these fiascos just don't want to admit their on the wrong track. I'm all for light rail, but it will only benefit my grandchildren (and my kids are only 12 now). I could propose a measure to reduce I-5, and I-405 congestion. Two in fact. First I-605 take Everett RT 2 to Monroe, south to I-90/RT 18 then on to Fife to Tacoma. Make it four lanes each direct with service roads that are two lanes each direction in congested areas like Monroe or Duval to lessen main highway impact. Put a toll on it. Main north south traffic not stopping in Seattle or the Eastside will love it. It will save them money even with the toll. Remove 405 tolls as they aren't needed then. Second. Takes more imagination. Is environmentally much better. Provide a B&O credit for employees that telecommute. Just get the cars off the road. The guys at Burger King may not be able to telecommute, but a huge portion of Boeing and Microsoft can, along with the companies that they feed work / projects. Pay for better communications infrastructure not messed up road tolling systems. The I405 mess created under the current schemes has cost human lives, and slows down normal traffic, essentially as a regressive tax on low income people who can't afford the tolls. And pass an initiative to stop these DOT projects that send WA money out of state. 30% of tolls collected and a higher percentage of fines for missing tolls is sent to out of state companies. Demand the state own the equipment, and the state administer the system. Caught by a red light camera? A New Jersey company just made money. Missed paying a toll, a Texas company just made money. As a daily commuter by car, I appreciate the new merge lane and the new shoulder lane. 405 (Bellevue to Lynnwood) is much faster to travel now vs two years ago. I'm concerned that I5 NB is not ready for the extra traffic though, as another person commented. I hope they get some relief as well. I appreciate all of the work that WSDOT is doing to help us out. The new merge lane and shoulder lane have already helped free up traffic in the evening. And its way better than it was two or three years ago. As another petson pointed out however, traffic is now getting backed up at the NB I5 exit. Looks like they made need some changes soon as well. HAHA! Yes, if only people knew how to merge this might work. Larry/Adam Bernstein, we have weave lanes in other locations along the I-405 express toll lanes and they work well. Manoj, thank you for your suggestion. Unfortunately, we do not have funding or authorization to build another lane at this time. sallynosnews, thank you for your kind words! Tim, thank you for your feedback. I-405 is a unique corridor and express toll lanes are still a relatively new type of toll facility nationwide. It's not an apples to apples comparison with regular toll roads elsewhere. Brent Bertolami, over the last decade, we’ve explored a range of solutions to congestion on I-405 including adding more regular lanes. We know from experience here and across the nation that we cannot build our way out of congestion. New general purpose lanes simply fill up with the growing population of drivers and do not manage the demand like high occupancy and toll lanes. dieseltheboxer, glad it's working for you. Thanks for letting us know! Cypress Van Horn, direct access ramps at SR 522 and SR 527 are in the I-405 Master Plan. Unknown, things like monorail and bus service/park and rides are the responsibilities of agencies and jurisdictions other than WSDOT. George Canon, without high occupancy and express toll lanes, everyone would be stuck in traffic with no options to get out of it. The managed lanes provide a choice for drivers to have a faster and more reliable trip. Mom drives to work, thanks for your feedback. As mentioned above, the I-405 master plan focuses on groups of projects that directly address the worst congestion chokepoints as funding becomes available. How do you rehabilitate nearly 22 miles of I-5?